Space-saving, fast and easy to clean secondary packaging machines. Efficient combination of compact design and high-performance, decentralized drive and control solution. Cama Group from the Italian Garbagnate Monastero specializes in the manufacturing of packaging machines, lines and industrial robots. The new secondary packaging machines of the series Break-Through Generation set new standards in terms of efficiency, reliability and easy handling. In this space-saving solution, Cama uses an intelligent, decentralized drive and control solution from Bosch Rexroth. For 35 years, Cama Group delivers packaging machines for the Food and Non-Food area, which meet the highest requirements on efficiency, accessibility and hygiene. With the particularly compact secondary packaging machines of the series Break-Through Generation, Cama drives forward current technologies to further increase the quality of the production processes. Thereby, the cabinet-free drive technology IndraDrive Mi from Bosch Rexroth plays an essential role, which enables an especially space-saving design of the packaging line and a dynamic, high-performance operation of the robot servo axes. 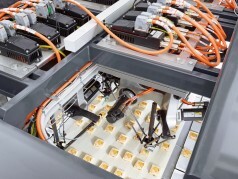 The Break-Through Generation impresses with an improved loading unit IG270, in which delta robots can work together in narrow space according to the production requirements – controlled by the Rexroth MLC with its integrated robotic functions, in which Cama realized a patented anti-collision software. For this reason, the robots can work in a joint workspace. This saves about 40% space compared to common Pick&Place systems. With the use of 12 delta robots, including feeder belt and empty container line, the whole system is just five meters long. Cama achieved this through the use of the cabinet-free servo drives IndraDrive Mi from Bosch Rexroth. Those are arranged on the machine in a space-saving and easy to clean way. Thanks to the easy daisy chain connections via hybrid cable, the wiring effort in the whole line is reduced to a minimum – the optimal solution to save time and costs during maintenance.